Everybody loves their congressman and hates Congress. 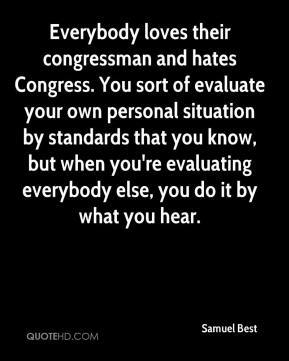 You sort of evaluate your own personal situation by standards that you know, but when you're evaluating everybody else, you do it by what you hear. 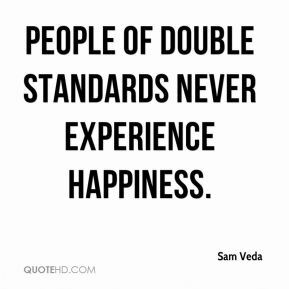 People of double standards never experience happiness. 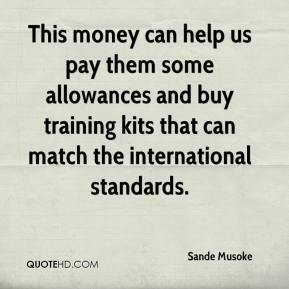 This money can help us pay them some allowances and buy training kits that can match the international standards. Entrepreneurship drives innovation. 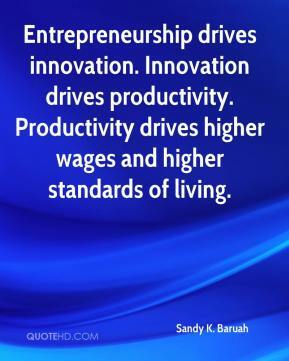 Innovation drives productivity. Productivity drives higher wages and higher standards of living. 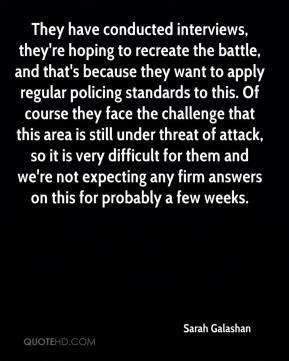 They have conducted interviews, they're hoping to recreate the battle, and that's because they want to apply regular policing standards to this. Of course they face the challenge that this area is still under threat of attack, so it is very difficult for them and we're not expecting any firm answers on this for probably a few weeks. 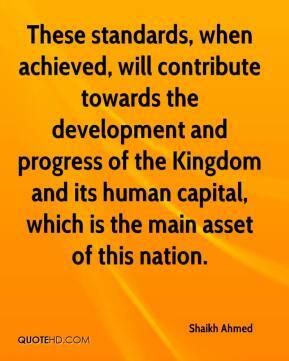 These standards, when achieved, will contribute towards the development and progress of the Kingdom and its human capital, which is the main asset of this nation. The Russians aren't waiting for standards. They have decided to move forward. 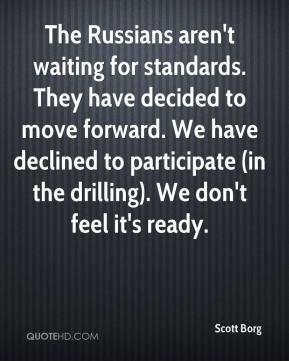 We have declined to participate (in the drilling). We don't feel it's ready. 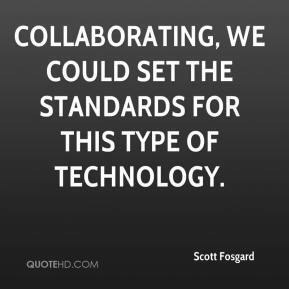 Collaborating, we could set the standards for this type of technology. Let's not be confused. 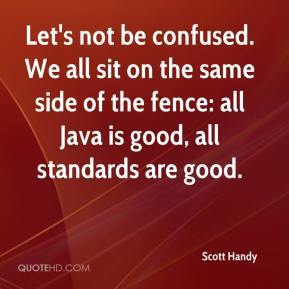 We all sit on the same side of the fence: all Java is good, all standards are good. 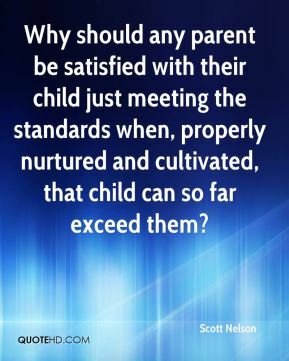 Why should any parent be satisfied with their child just meeting the standards when, properly nurtured and cultivated, that child can so far exceed them? There are some industry standards in flight numbering. 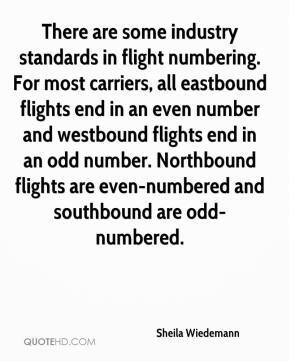 For most carriers, all eastbound flights end in an even number and westbound flights end in an odd number. Northbound flights are even-numbered and southbound are odd-numbered. 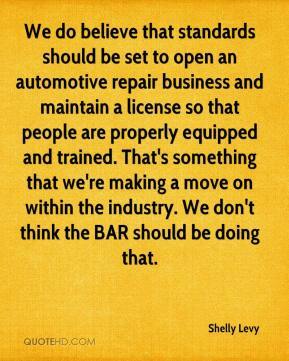 We do believe that standards should be set to open an automotive repair business and maintain a license so that people are properly equipped and trained. That's something that we're making a move on within the industry. We don't think the BAR should be doing that. It's always better from that standpoint. 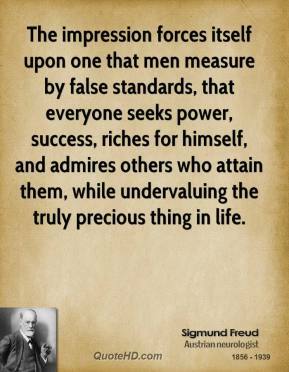 For us, we have to work harder to come up to the standards. 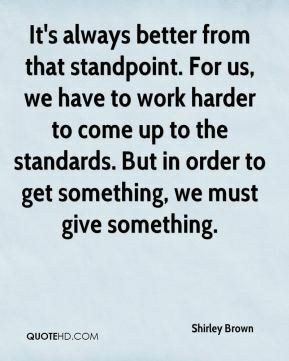 But in order to get something, we must give something. By getting its specification approved by a standards body that does not allow individual members is a strategy to make sure that Microsoft continues to control that standard and thus prevent it from becoming a baseline. 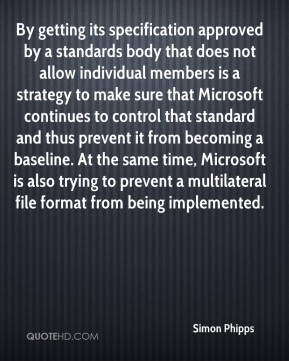 At the same time, Microsoft is also trying to prevent a multilateral file format from being implemented. He is a very important member of the team for both forms of the game, ... 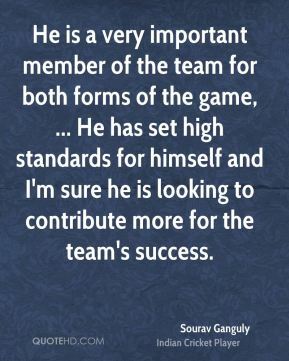 He has set high standards for himself and I'm sure he is looking to contribute more for the team's success. Or is it merely one that has run out of fresher ideas? 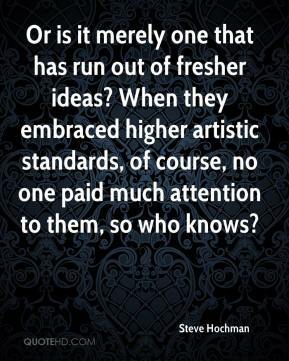 When they embraced higher artistic standards, of course, no one paid much attention to them, so who knows? 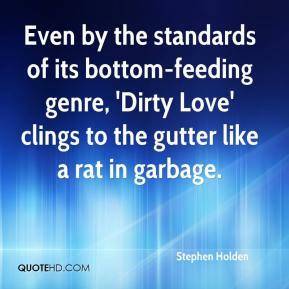 Even by the standards of its bottom-feeding genre, 'Dirty Love' clings to the gutter like a rat in garbage. 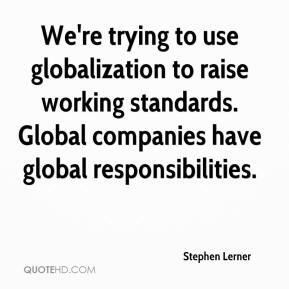 We're trying to use globalization to raise working standards. Global companies have global responsibilities. 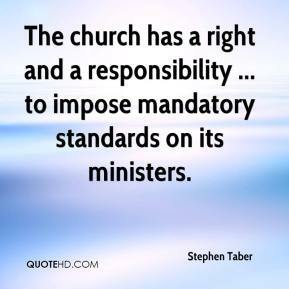 The church has a right and a responsibility ... to impose mandatory standards on its ministers. 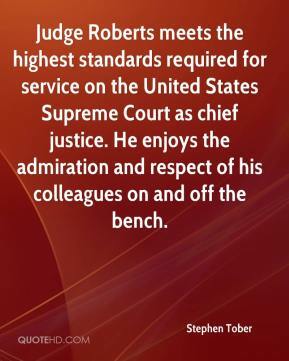 Judge Roberts meets the highest standards required for service on the United States Supreme Court as chief justice. He enjoys the admiration and respect of his colleagues on and off the bench. 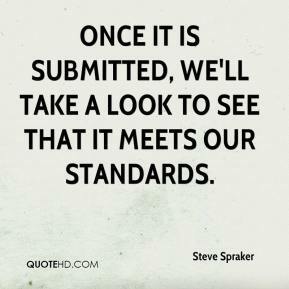 Once it is submitted, we'll take a look to see that it meets our standards. 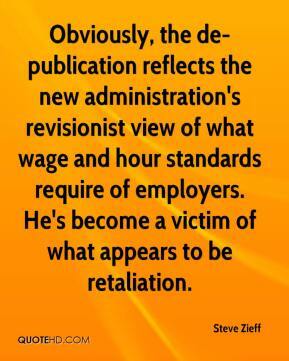 Obviously, the de-publication reflects the new administration's revisionist view of what wage and hour standards require of employers. He's become a victim of what appears to be retaliation. 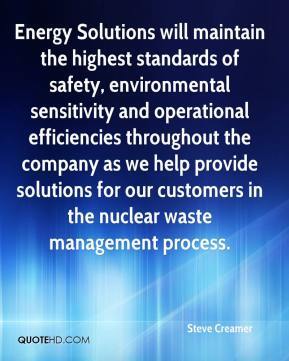 Energy Solutions will maintain the highest standards of safety, environmental sensitivity and operational efficiencies throughout the company as we help provide solutions for our customers in the nuclear waste management process. We look forward to building on our own demanding high standards and our excellent working relationship with Shell to deliver this new MEG plant safely and successfully. 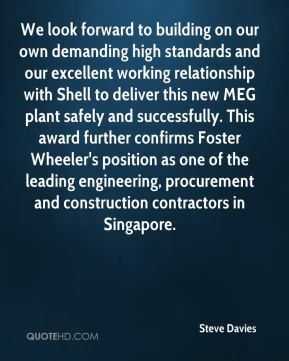 This award further confirms Foster Wheeler's position as one of the leading engineering, procurement and construction contractors in Singapore.